Yes, it is HOT HOT HOT!!! But the creek is my retreat! Last week my friend and I cleaned some of the upstream pools of branches and leaves making it easier to sit on rock ledges with a cool drink and soak in clear pools with cold cold water. It bring the body temperature right down to the point of goose bumps-marvellous!! We had a bit of wind the last two days and even rain and that brings a cool break. Our guests are enjoying the hot steamy tropics, taking plenty of siestas and reading books and 'chilling' out. Enjoy your December and Christmas break and celebrate the NEW YEAR!! Good Day! The news for June 2008 is, that we now have build steps into our fresh water creek. 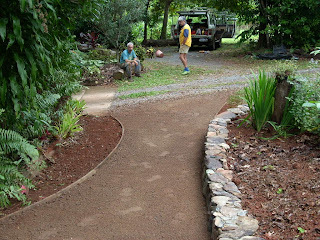 This makes a new look for the drive way and hopefully an easy access for the less adventurous to enjoy the beauty of our fresh water creek. You may even go for a swim! I always love swimming there, maybe not so much right now; you can picture me sitting here rugged up in all my best woollen jumpers and cardigans, including socks. Yes, winter is here, only for some hours in the morning and at night time, during the day is is gloriously sunny and warm. Good weather to work outside, walk at the beach, do that hike to Mt. Sorrow. The new gardens are coming along very nicely and I still ' discover' the new colours in the different hibiscus bushes. We had a surprising number of lovely guests during the wet season; travellers are more daring now than ever to explore the Wet Tropics during our summer months. Great! Even though the Daintree becomes a well known destination, it is still the place to get away from it all, and a place where nature and people come together.